How will you be identified if the international chaos entering upon us comes to full blossom in Canada? How will the policing authorities know that you are one they should be protecting or one they should be battering when the combatants can no longer be kept separated and one or another must be terminated? How will you know which persons in the milling mob about you perceive you as friend or foe? What sign or emblem will be upon you showing you are united in a common cause? 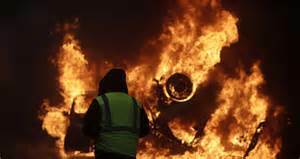 The French Government made it easy for people of a ‘common cause to identify in their stand against them’, generally speaking, when they mandated that all citizens were required to carry yellow vests in their vehicles for ‘emergency’ conditions they might face on the road. Unless one was completely a public transport personage there was nothing that one had to look for, to create as common emblem or to be faced with an additional expense for. They were already prepared to ‘identify’ and enter into the fray. Vehicles and vests were the ‘common element’ and they were mandated by Government. Here in Canada many companies use colored safety vests to designate distinct colors for certain jobs. For example, the red color is Fire Truck Red which is an intense bright red commonly seen on fire trucks and emergency vehicles while the Navy-Blue color is a dark/deep blue which is great for jobs that may get messy. But there is no vest mandated nor singular color of vest mandated as necessary by law to be in any and/or all vehicles. Instead, what we have mandated in Canada is the cause of the ‘chaos’ seen in France. We have mandated Big-Government interference in all aspects of our lives. Consider some of our mandated vehicle requirements: New vehicles must be equipped with anti-theft engine immobilizers, car insurance for everyone, vehicle safety inspections, vehicle back up cameras, seat belts on buses, packaging-labeling of goods carried, medical reporting requirements, entry level training for vehicle related employment, employer compliance training, electric light locations, transport of human and animal flesh, electronic logging devices, disability support requirements, drug and alcohol disorder compliance: This is but a small part of it. Mad Max Bernier of the Peoples Party of Canada resonates with messages about change of policies and doing politics differently. There are many policy issues dividing our country and threatening our prosperity right now surrounding pipelines, equalization, immigration, corporate welfare, the Paris Agreement, healthcare, foreign aid, the UN Global Compact, the UN Migrant Agenda and suffocating supply management. Big Government has mandated its own control in all these areas and Max Bernier is 100% correct that it must be reduced in size and move toward being a cost-efficient corruption free organization. Not to do so will end in a Canadian chaos that will dwarf France in its magnitude. And none of you will have clear cut identification when it does explode of ‘which persons in the milling mob about you are perceiving you as friend or foe’? At that point full panic will hit and ‘your greatest fear will come upon you’. That is the point of personal descent into an absolute chaos from which most people never emerge with personalities not irreparably psychologically damaged. This is what Trudeau’s desired mandate for you has evolved to and Conservatives under Scheer have been ‘mandated’ right into his program with him. You cannot remain one of Sheer’s anthropoids and see any true Conservative values emerge following the 2019 election. 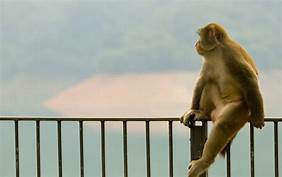 It is time to jump off whatever fence you may be mulling the future from and boot Trudeau out of Parliament Hill and toward jail now. When you do so make certain you allocate time to ensure white supremacists and neo-Nazi fascists like Travis Patron are entangled in his coat-tails. Your only safety from the descending chaos is to clearly identify yourself through publicly taking your stance now. Tomorrow I post Chapter Four of The Kid from Redvers – ‘Delusion Number Two’ – and what a delusion this man is buried under. This entry was posted in Hate Crime In Canada, The Money Bags Series and tagged blood in Canadian streets, Canadian chaos victims, identify or die, Justin Trudeau a Muslim stooge, Maxime Bernier, morally rotten Canadian leadership, Nazi Canada, Travis Patron, Treason, Wayne Eastall blows ‘harps’ by thinwahtruth. Bookmark the permalink.